Fifteen years ago, Hal Lasko’s family introduced him to the world of computers. As a former graphic designer and typographer, his grandchildren figured he might enjoy playing around with Microsoft Paint as a hobby. They certainly knew their grandfather well. 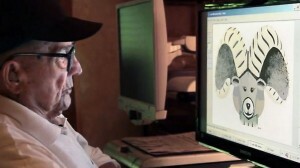 Now 97 years old, Hal spends a large chunk of every day in what has become his studio room, “painting” amazingly vivid and detailed pieces of artwork solely through the clicks of his mouse. Unlike other artists who want their paintings to be smooth and fluid, Hal prefers that his finished products remain pixelated. But his handiwork (or perhaps more aptly, his mouse-work) is so impressively executed that it’s quite astonishing for viewers to learn that the large pictures are actually thousands of tiny squares. Two of Hal’s paintings have been featured in an art exhibit at a senior center in Rocky River, Ohio. He is interested in hearing feedback, positive or negative, from others. Trees are some of his favorite things to paint, but he has also put together images of animals, snow-covered houses, rollercoasters and “Space Highways”. According to his family, Hal’s love for computerized painting has provided him with much joy and a sense of purpose. His enthusiasm for art and for life has been unwavering and his intense focus while at the computer has kept his mind active and engaged. Hal’s paintings can be found on his website. Thank you for inspiring us with your passion and creative spirit, Hal!